Stir Up Sunday, for those who don’t know, is a British tradition for making the Christmas pudding. This tradition dates back to Victorian times, held on the last Sunday before advent, when everyone in the household gives the Christmas pudding mixture a stir and makes a wish! This is my first year to follow this tradition and although my pudding is quite non-traditional, it’s been very satisfying to create my own Christmas pudding from scratch. 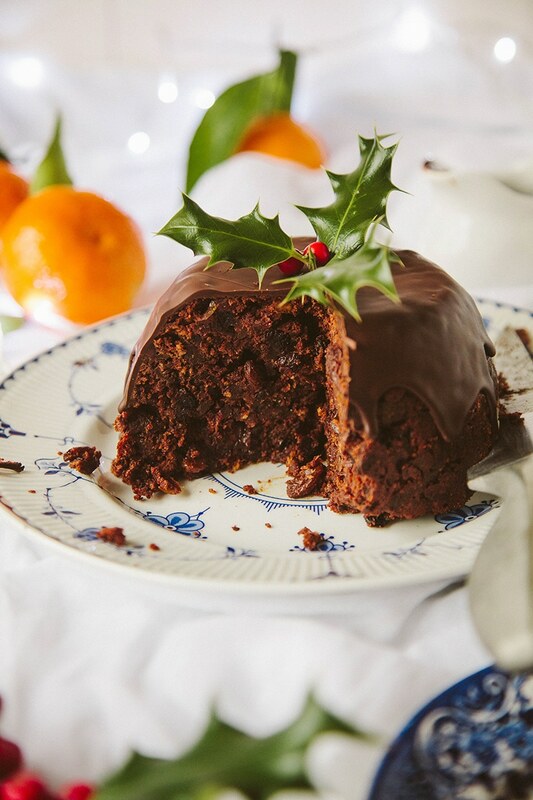 A Christmas pudding even Christmas pudding-haters will love! 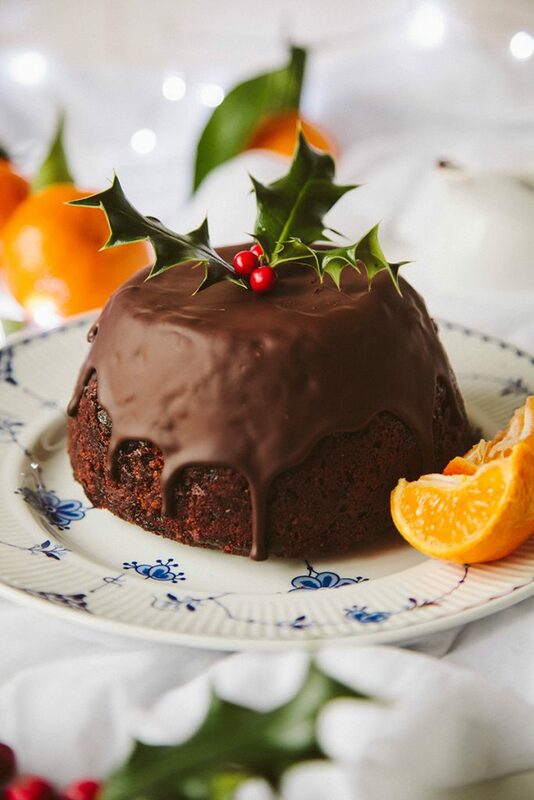 A non-traditional Chocolate Orange Christmas Pudding that's vegan friendly too. If you can't get hold of ready-soaked mixed fruit, prepare it the previous day by adding the mixed fruit and peel to a bowl with approx 3 tbsp brandy. Leave overnight. Prepare a 1 litre pudding basin by greasing it with vegetable oil and placing a circle of greaseproof paper at the bottom. Mix the flour, arrowroot powder, baking powder, xanthum gum, cocoa powder, sugar, breadcrumbs and spices together in a bowl. Stir in the orange juice and zest, vegetable oil, water contreau and orange flavouring. Fold in the dried fruits and the chocolate. Transfer the mixture to the pudding basin. Tear off a large square of the greaseproof paper and tin foil, placing the greaseproof paper on the bottom. Create a pleat by making a 1-inch thick fold in the centre of both layers. Place on top of the pudding tin and scrunch the foil around the sides to secure. Tie securely with a piece of string. Fold in the excess paper and foil to help make it water-tight. Create a handle by tying another piece of string to one side of the tin (where you made the knot from the previous string) and tying it on the opposite side so you can easily lift the pudding out of the pot. Place a trivet or upturned saucer at the bottom of the pot (I used a small heat-proof container lid) and place the pudding on top. Fill the pot half way up with hot water and bring to a simmer. Cover the pot with a lid and leave to steam for 3 1/2 hours. After 3 1/2 hours, lift the pudding out of the pot and leave to cool for a few minutes, until the pudding starts to shrink away from the sides of the tin. Carefully, using a spatula knife, loosen the pudding from the sides and turn over onto a plate. This pudding can be kept, wrapped in the fridge, for up to 6 weeks. To serve, you can eat it as it is at room temperature, or re-steam it for 2 hours to serve warm. 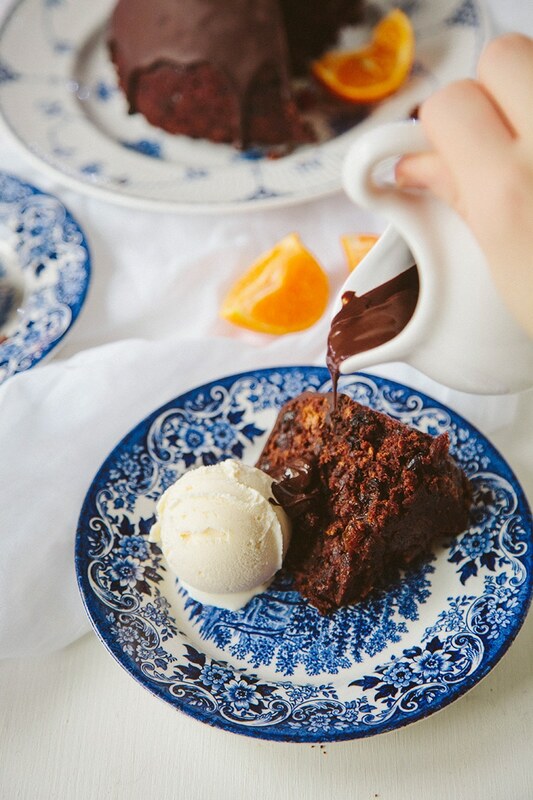 Add some melted chocolate sauce and a scoop of ice cream for Christmas dessert! 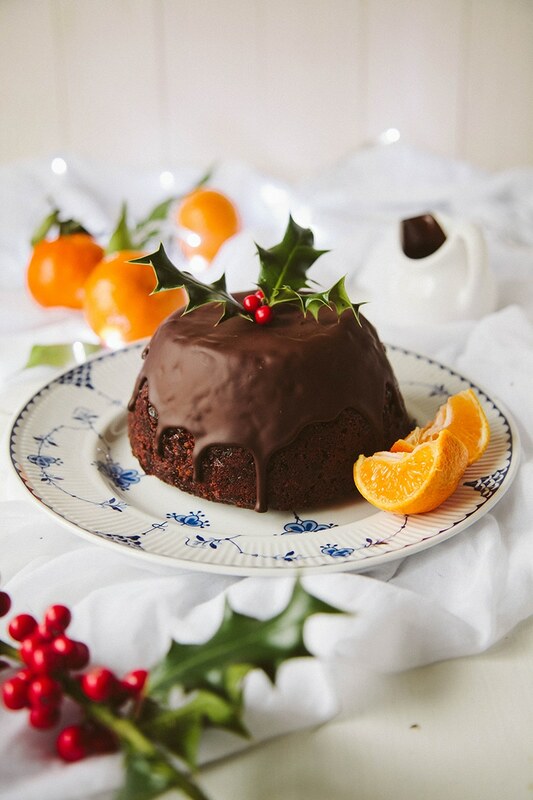 For more Christmas puddings with a twist, visit the Waitrose recipe collection! Xantham gum is a binding agent that’s often used with gluten free flour to ensure binding occurs. If you are not using gluten free flour the arrowroot should be enough to bind the pudding. To be extra sure you could add a tablespoon of soya flour or cornflour instead. To re heat, can the pudding be microwaved? Hi Aimee I made this last year and it went down a storm! Can I ask you though, please: 1. How do you make the chocolate sauce? 2. Do you 'feed' the pudding? 3. Is there an alternative resteam heating method? I'm a guest and I don't fancy using my hosts hob for 2 hours and heating the sauce. Hi Tiff, sorry for not getting back to you sooner. Glad to hear you enjoy this recipe! To answer your questions: 1) The chocolate sauce was literally just melted chocolate with a bit of dairy-free butter or coconut cream. 2) No need to feed it but you can certainly try it if you want to make it extra juicy. 3) You can cover it in foil and heat it in the oven for 20-30 minutes. You might need to add a few drops of water into the tin with it. Hope that helps! Thank you for this recipe--it looks like it would go really well with a little bit of grand marnier! I'm thinking of making mini versions of this recipe, but it would require baking the pudding in the oven instead of steaming it...would you advise against this? Any tips? yum!!! 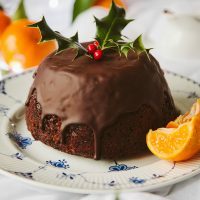 this will be my first vegan christmas & i've been thinking a lot about what to make for pudding - i think this could be a winner! Normally I'd stick with my own recipe for cherry and pecan Christmas pudding but you've really made me want this version now! Love the flavours. Wow Aimee! That's an incredibly decadent and luscious pudding!